Graham Sharland, New Zealand Tree Grower August 2008. The highlight of the recent conference field days for me was the day spent at Woodside Forest near Oxford. This property was logged some time between 1895 and 1909. The charcoal visible on cut stumps indicates that any forest remaining was largely destroyed by fire. From 1914 the property was managed as an economic grazing unit until it was abandoned during the depression of the 1930s. After the depression it passed through a number of owners who used it as a summer run-off block for about 100 sheep. In 1973 it was purchased by John and Rosalie Wardle who developed a forestry programme. They started to manage the re-growth black beech, most of which originated from the 1940s, for timber production. Radiata plantations were established under the Forestry Encouragement Scheme on areas of grassland and gorse which had not yet reverted to native forest. The property now consists of about 30 hectares of predominantly radiata plantations, 84 hectares of black beech and the remaining area in pasture. A total of 70 hectares of the beech are being managed sustainably under a Forests Act approved management plan for timber production and the remaining 14 hectares are dedicated as reserves. There are smaller plantings of a range of species including Douglas fir, larch, coastal redwood, Tasmanian blackwood, spruce and various cypresses. John and Rosalie welcomed three bus loads of farm foresters at our first stop beside an arboretum of 14 southern beeches. After John gave a brief safety talk and an acknowledgement of assistance from several organisations we set off through a mix of native and exotics and were pleasantly surprised by very strong native bird song. 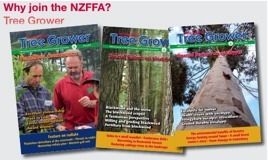 Woodside Forest has received a number of awards including the 1995 South Island Farm Forester of the Year, and the 2003 Transpower-Landcare Trust award for innovation in sustainable farm forestry. 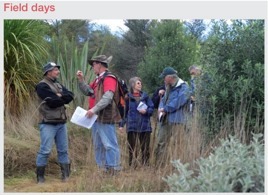 In 2004 it was one of three forests selected in New Zealand by the UNFAO as demonstrating exemplary forest management. Both beech and pine are being harvested systematically using selection systems based on target diameter rather than area and rotation period. The pine is sold as logs on a graded sale basis, and the beech is contract cut on the site. The total property is in the process of being placed in a QE II Open Space Covenant which will allow continued sustainable harvest of both the beech and pine. Then there is John’s work for the indigenous forests section and its magazine Indigena. The north west wind is frequently of gale force. The management strategy for both black beech and radiata pine has been to develop a continuous-cover, uneven age structure in both forest types. The aim is to promote stability at stand and forest level, retain and enhance biodiversity and wildlife habitat, and positive cash flow. This is being achieved by selective harvesting of trees of a target diameter, rather than harvesting by area and rotation period. This uses natural regeneration rather than replanting, with thinning and pruning to promote the development of a high quality future crop. Most of the morning was spent in radiata pine planted in 1973 and 1974. First, we saw a demonstration of selective logging by Phil Russell Logging of Oxford – a two-man crew with a Clark 666C skidder. Two trees were felled, the first with machine assistance. Both trees had been previously marked by John as being over 60 cm diameter at breast height, the target diameter. Consideration is also given to tree form, gap creation to aid regeneration and spacing of residual trees. A harvest site normally involves a single tree, although groups of two to three trees may be harvested where this assists site development. Very precise controlled directional felling is essential to prevent damage to the residual crop and to protect existing regeneration. It includes techniques such as pulling trees uphill during felling. This was followed by trimming, log making and cross-cutting, all at the stump. The resulting logs were then skiddered to a mini landing from where they were loaded and carted away by MWT of Rangiora using a self loading log truck. At this stage Leith Christie of Forest Management, Phil Russell and of course John Wardle capably fielded the many questions. Lunch was beside the homestead with brief talks by Peter Buckley of Farmers Mutual on tree insurance and negligence, and Rob Miller of MAF Indigenous Forestry Unit. The afternoon saw the focus change to beech management. We were shown a natural pole stand, then a 20-year-old regenerated stand dating from harvest in 1987. This demonstrated current silvicultural practice. About 800 stems per hectare are selected on the basis of spacing, form and vigour, and all competing stems are removed from a one metre radius around each.